Another Country is the first exhibition to be held at The Nunnery, a new contemporary gallery located a stone’s throw from the Olympic Park. Since opening its doors in January, The Nunnery has showcased the work of two highly acclaimed, award-winning artists Cara Nahaul and Matthew Krishanu. These artists have come together to explore the themes of travel, dislocation and memory. They both use photographs from their childhood as starting points for their artwork. While Krishanu uses photos from his own childhood in India as inspiration, Nahaul uses photographs of her grandparents in Malaysia. The deft strokes, bold shapes and fresh colours of both artists leave the viewer wanting to know more about the distant lands they depict. But not only are these vibrant compositions easy on the eye, they also explore the artists’ deeply personal relationships to their past. Krishanu explain: “The paintings are about stepping into ‘another country’ – one created from a combination of old photographs, memory and imagination. 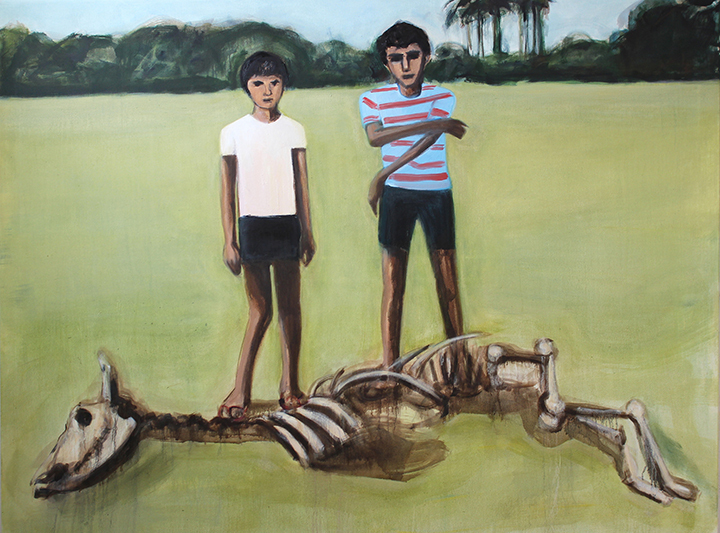 While Khrishanu’s paintings depict his experience of growing up in India and embarking on childhood adventures and games with his brother, Nahaul’s paintings explore the far-off lands of her grandparents which she felt quite distant from. In using paint as a way to access the past, both artists explore the complex relationship between the past and memory. Furthermore, by using art to re-imagine the past and transform old memories, the exhibition unearths the ever-shifting, circuitous nature of memory. Both artists have been keen to maintain the community spirit of Bow Arts – the educational arts charity which runs The Nunnery. Since the exhibition opened, Krishanu and Nahaul have worked with several local schools, organised talks and are planning an exhibition tour on Thursday 6 March.